Which answer choice is an enantiomer of the molecule shown below? An enantiomer is defined as a stereoisomer that is a mirror image of another. In other words, if a molecule was placed in front of a mirror, its mirror image would be the enantiomer. Questions such as these require a bit of visualization, but should be easy points. In addition, if you see the answer choice quickly and are confident in your decision, move onto the next question without spending time on the other choices, as mental geometry and visualization may take more time than anticipated. A mystery compound has only one chiral carbon. The enantiomers of this molecule are placed in separate beakers. Which of the following statements is false? Enantiomers are defined as compounds that are mirror images of one another. They have the same basic physical and chemical characteristics, but differ in how they bend plane-polarized light. Although we know that the angle is inverted between configurations, R- and S- does not tell us which direction the light will be bent. This information requires further experimentation. Note that in some cases, enantiomers can demonstrate different properties, such as different levels of toxicity to the body. For this reason, certain drugs are selected for only a single enantiomer. Shown above is the chemical structure for penicillin, a common prescription drug. How many chiral carbons does penicillin have? The correct answer is three. The key to finding chiral carbons is to look for carbons that are attached to four different substituents. We can immediately eliminate any carbons that are involved in double bonds, or that have two hydrogens attached. Given this, we find that there are three chiral carbons. Note that carbon chains of varying content will qualify as different substituents, allowing chiral carbons to bond to two other carbons. How many chiral centers does the following molecule contain? A chiral center is defined as a tetrahedral atom with four unique substituents. In the molecule above there exists only one carbon that has four different substituents, which is carbon #4 (counting from the right). Carbon #4 has -chloro and -hydroxy groups, as well as two different longer alkyl chains. No other atom has four unique substituents. 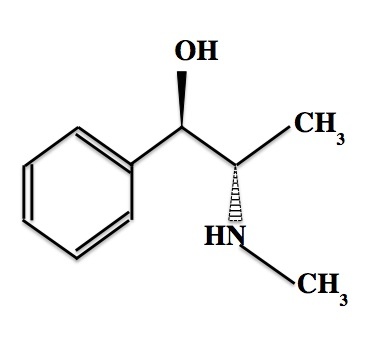 Ephedrine has the IUPAC name of 2-(methylamino)-1-phenylpropan-1-ol. The stereochemical assignments for carbons 1 and 2 are __________ and __________, respectively. The molecule contains only one stereocenter. We can easily identify the carbons based on the IUPAC name. Carbon 1 will be bound to the phenyl and hydroxy groups, while carbon 2 will be bound to the methyl and amino groups. For carbon 1 (the carbon attached to the -OH group), the lowest priority group (hydrogen) is already pointing away. The other three groups descend in decreasing priority in a clockwise manner, , resulting in an R designation. For carbon 2 (attached to the -N-CH3 group), the stereochemical assignment is S. The lowest priority constituent (hydrogen) is pointing out of the page. The other three groups are in descending priority in a counterclockwise manner, . An isomer exists such that half of its chiral centers have opposite configurations compared to the original compound. What is the relationship between the isomer and the original compound? Absolute configuration tells us the orientation of atoms around a central chiral carbon. Enantiomers are compounds that have the opposite absolute configuration at every chiral carbon in the compound. If only half of the centers are opposite of one another, the two compounds are diastereomers. Diastereomers are isomers in which chiral configuration differs at at least one chiral center, but may differ at several.